East Coast swing dancing has become one of the more popular of the social dancing types. Evolved from Lindy hop, it can be found in ballrooms all over the world, as well as romanticized in movies such as Swing Kids. With its own definitive style, very different from its sister West Coast swing, this vibrant dance is still growing and changing. The dance is particularly American, having its genesis in the dance halls of the swing era starting in the early '30's. It is ironic that this dance, now a mainstay of the social dance world, originally was rejected by the American Society of Dance Teachers as a "fad." They first tried to ignore it, hoping it would fade out, and then ridiculed it. It took ballroom dance pioneer Arthur Murray to see the dance for what it was: the next step in the evolution of American dance. He sent his dance teachers (at one point there were over 3,000 Arthur Murray studios in the U.S.) out to the clubs to learn the steps and begin teaching them. The only problem with this was the variety of steps, different in every town. With the help of Dean Collins, Hollywood choreographer and swing dance competitor, the Arthur Murray instructors began to standardize East Coast Swing dancing. It wasn't until 1951 that the basic repertoire was codified into a syllabus by Lauré Haile, another Arthur Murray instructor and competitor. She altered the version of the dance from the eight-step version into a modification of the Foxtrot with a six-step basic, although several of the more complicated moves do have eight steps in the pattern. The dance was featured in many movies, starting in 1937 with Way Out West and including several John Wayne movies such as The Fighting Seabees and A Lady Takes a Chance. In the more recent era it has been featured in Swing Kids and several of the popular dance shows such as So You Think You Can Dance and Dancing with the Stars. This resurgence in popularity has led to the dance being featured at "swing nights" and competitions at clubs around the world. Triple Step - counted "1-2-3, 1-2-3, rock-step" this is used for slower dances or dancers with very quick feet. Touch Step (double Lindy) - an interim skill level on the way to the triple step, this is counted "one-touch two-touch, rock-step." Single Step (Single Lindy) - counted "one, two, rock-step" this pattern is most common for very fast music or people just beginning to learn East Coast swing dancing. The "rock-step" in all of these is done by the lead putting all the weight back on the left foot, then shifting the weight forward onto the right before bringing the left foot back underneath the body for the single, touch, or beginning of the triple step. The follow would mirror this, rocking back on the right foot, forth on the left, then stepping back on the right for the next phase of dancing. 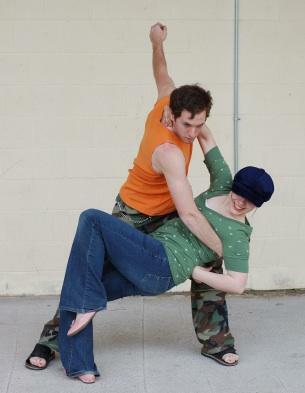 Although considered part of the East Coast swing repertoire, there will be stylistic variations depending on the part of the world the dance is performed. To be considered a "swing dancer," though, one only needs to know the basics and a couple of patterns. Most important is a love of the dance, an appreciation of the music, and a willingness to have fun.